Earlier in the year, when Moshling Madness came out it was revealed on Lummox’s card that he had a seed combination. Moshi were asked, and they said it would come in the future, we didn’t think this soon. The only way to get Lummox was by buying the Moshling Mall at a whopping £49.99! I know a lot of people bought the mall, just so they could get Lummox! Money wasted, perhaps? Now today, his seed combination has been officially released. Please continue reading if you wish to find out Lummox’s code! 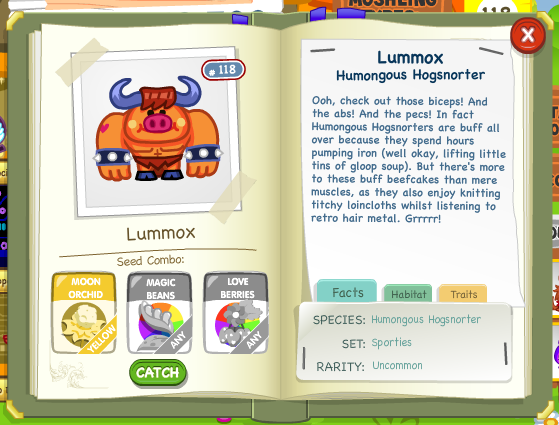 You can still get Lummox from the Moshling Mall, planting any two seeds with the Alpine Pinkerbells! DON’T FORGET! YOU COULD FIND 100+ MOSHLING COMBINATIONS AT OUR MOSHI MONSTERS EXPRESSWAY MOSHLING CODES PAGE! Do you have Lummox? Do you know anyone who has Lummox? What do you think? Are you happy? Are you sad? Let us know in the comments! This entry was posted in Big News, Moshi Monsters, Moshling Codes, Moshling Garden, Moshling Zoo, Moshlings, New Moshlings, Rosscp, Sporties and tagged how to get lummox, how to get lummox moshi, how to get lummox moshling, How to get Lummox Moshling on Moshi Monsters, how to get lummox on moshi monsters, How to get moshlings on moshi monsters, Lummox, monsters, moshi, Moshi Monsters, Moshi Monsters 2009Fire15, moshi monsters codes, Moshi Monsters Expressway, Moshi Monsters Lummox Moshling, Moshi Monsters Moshling Lummox, Moshi Monsters New Moshlings, New Moshlings by Rosscp. Bookmark the permalink. It does doesn’t it! 😉 Plus the Moshling Mall comes with two exclusive figures and some exclusive in-game item codes! Cool! I’ll get him as soon as I get the moshling I’m currently trying to get!